Hanging out in the National Gallery, where all the cool kids are, I came across an art anomaly. 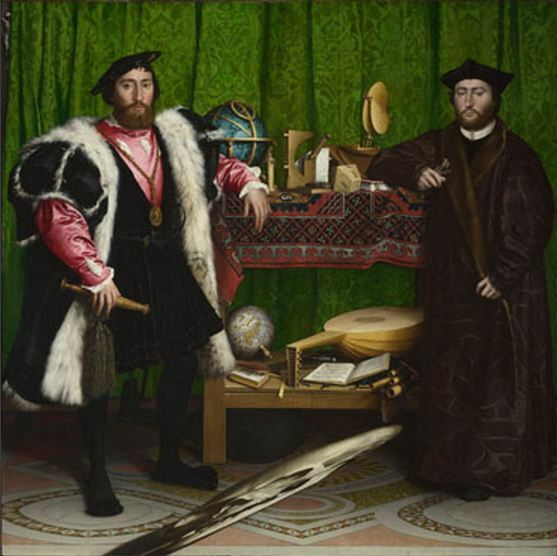 The Ambassadors by Hans Holbein the Younger is a fairly standard portrait of two men. However look closer, and you see that it features a crazy slanted skull in the foreground. It is designed so that when you stand on the right hand side of the painting and look across it, you see a perfectly formed skull. To me it looks like Hans had an early edition of Photoshop (very early, it was painted in 1533 so maybe CS-20?) and got bored in the middle of transforming the layer. Men in fur coats: So what are you going to paint in front of us? Holbein: I was thinking a skull. Men in fur coats: A skull? Really? Holbein: Yes it represents mortality, and the chicks dig it. Men in fur coats: Well I guess that is ok, a different perspective is always good.